We have criminals on both sides. What really matters is how both sides react to their criminal acts. In that respect, it's not even close. As a side question: why none of the bombs exploded? Is it really that hard to make one that actually would? This does not pass the smell test. You said that not me so you answered your own question. Well..yeah...I asked you as we were in a conversation, my fault. I personally think there must be alot of hate involved to get such an idea and take the time to think about it, make a plan, search for the info you need, gather the stuff and actually build a bomb. I'ts nothing like a crime of passion in a moment when the blood boils (who doesn't know about it)...it's something long term...deep...cultivated even. We all know that there is an increasing number of ultra right-wing armed militias out there which are prepared for another Civil War. The guy who sent the bombs as well as the animal that killed the people in the synagogue are either part of that movement or sympathize with it. They want a confrontation. Trump with his rhetoric and actions delivers the smokescreen for their activity and is therefore (at least in part) responsible for what's going on in the country. You are dealing with a member of the Trump cult, BB. These people will find any excuse for the behavior of their leader and his followers. search for the info you need, gather the stuff and actually build a bomb. They call that premeditation B.B. Just watch the drive by news medias and you will see how they are promoting this Hate by the Commie Left Cults. They keep pushing and pushing until they push the wrong person to far. Kind of like kicking a dog on a chain, keep it up long enough and you will get bit. Then the Commies want to blame it on the dog for biting them. Look Buddy, it was ONE crazed nut that built the bombs and ONE crazed nut that shot the Jewish people YET when the news media reports it they always use we and us and them and they.........NO, it was not US, it was two individually mentally unstable people that did it. The guy who sent the bombs as well as the animal that killed the people in the synagogue are either part of that movement or sympathize with it. You just proved my point you idiot. I am part of the Trump movement and sympathize with it and I haven't killed anyone today. Who is "they" you Commie agitator ! YOU are the problem and YOU are the responsible ones by spreading such Commie propaganda. YOU are the enemy of America. ....the black thugs in the US cities that kill the people in those cities are part of the Democrat and the ultra-left loon movement or sympathize with it....since blacks vote 90% for the Democrats and the ultra-left loons like Maxine Walters. Therefore, murders in Chicago are, in part, her fault. Do you see how stupid such statements are or is that analogy too complicated for you? I must be ill......I find myself agreeing with your last post......help someone! Oh, I know that. And you are sympathizing with party over country, pro life until you are born, weapons over elementary school children, pedophiles and the good people amongst the neo-Nazis. You hate foreigners, brown people, Jews, black people, atheists, liberals, Democrats, science and everything else around you including yourself. You are a disease. 60 million people had to die to fight the ideology you sympathize with. That's why I can't stand your ilk. or is that analogy too complicated for you? Whataboutism. Deflecting as usual. No matter what Trump and his minions feed you, you guys swallow. Do you take it from behind as well? My post was meant to say that I don't recognize the "responsible in part" bs the Trump haters love to throw around. Either he is responsible criminally or liable enough to be sued in civil courts or he is not. "Responsible in part" without saying in what part and without filing a criminal charge or civil suit is just throwing noodles and hoping that they will stick for political reasons. Based on that standard, everybody is responsible in part for something. Even you. You drive a car? You are, in part, responsible for global warming, the hurricanes and floods. Those kill. You are, therefore, a murderer. NYT advocating for USA's white replacement with 3rd world immigrants. De Rigueur mainstream position. You're delusional as I hate no one but Crooked Hillary. You spew your Commie lies and you think if you tell them enough they will come true. You ARE an enemy to America and that is why I can't stand you. And I don't say that just because you are Brown, you are just plain brainwashed Commie scum. Did you see on CNN that the mail bomber did not like Trump because he supported Israel ? Hmm, weird. The link in my last post evaporated. 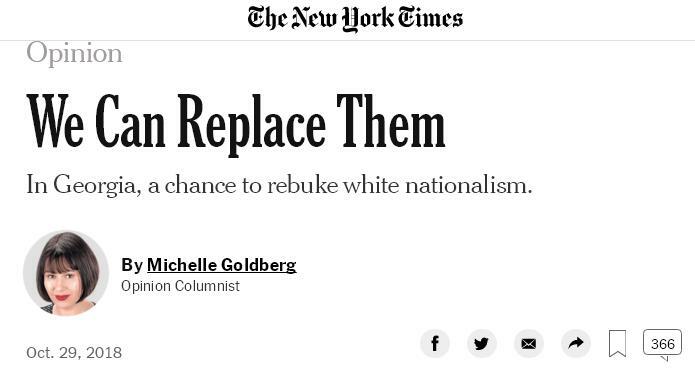 Here is a picture of the New York Times article headline "We Can Replace them". "Right now America is tearing itself apart as an embittered white conservative minority clings to power, terrified at being swamped by a new multiracial polyglot majority." Regarding the letter bombs sent to George Soros and his cronies, the shooting at the jewish synagogue, it shows the awakening of the whites in the United States, their unification and organization, and their showdown with "the system" in the US. Take a look at CNN. it's 24/7 updates from Pittsburgh, different panels accusing president Trump that somehow he is for this responsible. It is at the coverage of events such as these that you discover that the mainstream media is not in the service of American people, instead it serves "the elite". The Snowflakes have already thrown everything they have at Trump to no avail which upsets them into being even more uncivilized. That is the picture the drive media wants to brainwash you with to promote their Commie Agenda. What it shows (and I am so fvcking tired of repeating it) is that two MENTALLY ILL people (lone dogs) when out on their own and wigged out. The Left bias media uses this stuff to blame Trump when in essence it is the corrupt media's fault if anybody's. They have been relentless even before he took office to have him removed before he was even sworn in. WHY, because Trump loves America and the Constitution and stands for everything they are against and their agenda to destroy America. Just look at the progress Trump has made for America in just two years after a lost decade with obama. You have to live in America to understand it's demographics. If a person would take the demographics and put them into perspective they would understand the PROBLEM in America. So when you try to play the race card please look at these FACTS first as these cities are very diversified. Without quoting Einstein, I asked a couple of black guys where I used to work why blacks vote Democrat over and over again instead of being swing votes. They reported me to the HR. From that point on, I never spoke to a black guy. As far as those cities above, if you can't get rid of them, at least contain them. The Europeans don't understand that those ten cities (plus about ten more like Chicago) are where 90% of the major crime (killings) take place in America to screw the national average. Yet the further you get away from these "diversified" cities the less crime there is. Does that help explain why the "white privileged" choose not to raise their families in those cities if all possible. Does that help explain why the people voted for Trump who isn't Politically Correct. Trump calls it the way it is and doesn't sugar coat these FACTS. The Dems want more money to fix this problem yet the country has thrown billions of $$$$ to fix it and it hasn't worked. And the real problem is that we are on a third generation of not having fathers in the home, taking prayer out of our schools, a moral decay and the drugs. Fix those problems that money can't fix first which Trump is trying to do but being undermined by the Liberal Commies that want to destroy our culture with their propaganda. So yes, America is very aware to what is going on and are as hell bent to Keep America Great as the Commies are to destroy it. Get the picture now ? the problem with your daft thesis is that the richest cities also have democrat mayors - NY, SF, Seattle, Portland, Washington etc. In general people in cities vote for democrats for a number of reasons - more students, more minorities, more interest in rent/healthcare/infrastructure. And there are plenty of poor areas that vote Republican - West Virginia, rural Ohio, lots of the south, poor parts of Indiana etc. Aren't the main wealth generators on the East- and West coast generally liberal and democrat? The problem is in defining what "rich cities" means. Rich like in having a balanced budget or rich as in having rich individuals living there. Chicago is "rich" if you look at who lives on Lake Shore Drive and further north. It is a total financial disaster, right along with the state of Illinois, with the annual deficits and the unfunded pension funds in excess of 130 billion bucks, all caused by the irresponsible Democrat and RINO morons. "Aren't the main wealth generators on the East- and West coast generally liberal and democrat?" No. I already beat that pony to death, so here is a short answer: wealth is created ONLY through manufacturing, mining and agriculture. Period. End of the story. "Wall Street" didn't create one dime worth of wealth in its entire history. WS is where "wealth", aka money which in itself is not wealth, changes hands. Like in the Vegas casinos. That's it. Not from anywhere from the last 30 to 100 years like the rest of these high crime cities have. In general people in cities vote for democrats for a number of reasons - more students, more minorities, more interest in rent/healthcare/infrastructure. The students have been dumbed down by Saul Alinski instructors, the minorities have been given something for their vote, and both want free rent and healthcare and could give a rats patute about infrastructure. Absolutely as I am one of them. Just because you are poor doesn't mean you are uneducated. LOL - you are back on the meme about wealth only being created by mining. Tell your supervisor that this has never been the case, whatever he was taught in the Moscow School of Trade back in Brezhnev's day. LOL - you are back on the meme about wealth only being created by mining. If you don't know how to count to three by now, it's too late, and I am not going to struggle with your reading comprehension issues. You must be one of those econo-retards who believes that printing money is creating wealth, too. You don't mind if I add you to my contempt list, do you? "Were the only country in the world, a person comes in, has a baby, and then the baby is essentially a citizen of the USA for the next 85 years with all of these benefits"
Its sounds crazy huh? The 14th amendment was created for former slaves after the civil war. Seems a bit outdated too! Now, its just being used as a loop hole for foreign scum to invade our country and leave their anchor babies behind so more invaders can funnel in. Did you know the Chinese set up birth houses in California so the little chinks are born citizens? It has to stop!! Im sick of foreign scum taking advantage of the USA! Only Trump has enough balls to put an end to this ridiculous policy. I have to confess that when I get up in the middle of the night to take a leak, I very often can't fall asleep I am so f****** pi***d off about this immigration s***. Not that I am 76. Not that I can get sick and die in six months. It's the vision of that Latino sewer that keeps me awake. I even wrote to Trump with an offer to make a donation to the Wall Fund, if it exists, and work for free to build that damn wall. It's the vision of that Latino sewer that keeps me awake. The sewer is flowing this way and another turdavan is forming in Guatemala. Did you see the first mob of invaders headed this way, mostly all young males waving their home countries flags and clashed violently with the Mexican federales. Total disrespect towards all they encounter, and they want to have their anchor babies in our hospitals!! These ppl dont have any respect for the USA and Trump vowed to not let these invaders in. Over 15K troops are headed to the border to stop this scourge from entering. and work for free to build that damn wall. If I were you I would scrap the statue of liberty first....especially with this text..."gimme your poor"...it makes the wrong impression. Im sure they didn't expect a mass exodus of ppl forcing their way over the border from every crap hole on the planet when France gave us the statue. They should replace the quote, change it like the Australians did when they turned away all those ships full of refugees " Australia Full" it had a nice ring and gets right to the point.